John Andrews Murrell (1806–1844) was a horse thief, a slave stealer, and a counterfeiter who was transformed into a legendary highway robber and murderous outlaw whose criminal exploits took him throughout the South in the 1820s and 1830s. Modern-day treasure hunters are still trying to find his supposed caches of hidden gold in Tennessee, Arkansas, Illinois, Louisiana, and Mississippi. The disappearance of two slaves belonging to a friend in 1834 prompted Virgil A. Stewart to pursue Murrell in the hopes of learning their whereabouts. Stewart befriended him on his journey to Arkansas, and he claimed the unsuspecting outlaw shared with him knowledge of his secret criminal network called the Mystic Clan of the Confederacy and his intention to incite a slave insurrection as a diversion for his Clan’s thievery throughout the South. 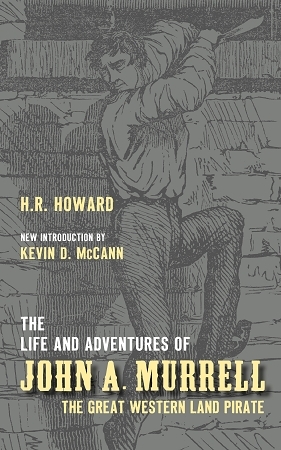 Stewart exposed Murrell’s alleged plot, was the star witness at his trial, and wrote a tell-all book that was the basis for the legend of John A. Murrell, the Great Western Land Pirate. The Life and Adventures of John A. Murrell, the Great Western Land Pirate, published in 1847, was the first biography about the legendary outlaw of the Old Southwest. It expounded upon Stewart’s claims and added literary flourish to his colorful tales of Murrell’s past adventures. This BrayBree Vintage Edition presents the original narrative and illustrations with new footnotes and an index.